The caves were formed during the Miocene period, 15 or 20 million years ago. For many years they were under sea level and due to tectonic movements they surfaced. The Guatuzos aborigines discovered the caves. 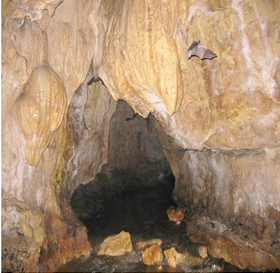 Limestone rocks, stalactites, stalagmites and corals, form most of the caves. The whimsical stone formations are formed by the underground river. The length of the tour into the caves is 1 � hour, during this time we will find marine fossils, and also bats, spiders and crickets. Because we will have to walk through the river and waterfalls from the upper part of the cave, we recommend our customers to take light clothes, hiking shoes and extra clothes to be able to change when they finish the exploration of the caves. The equipment for the tour will be provided to each client. includes transportation, guide, equipment, entrance fee and drinks. long pants, t-shirt, hiking shoes, extra clothes to change and towel.